Kennett Popsockets are now available! Did you know the big Mushroom Cap Half Marathon is this weekend, Saturday November 3rd?Bet you didn’t know there’s a Charity 1-Mile Run during the marathon that everyone can do.Proceeds for the run will go to Unite For HER who provides really cool support to local families who are fighting breast cancer. So come out on Saturday the 3rd, bring your friends, wear your pink and show your Kennett PRIDE by supporting Unite For HER!! Now over to a 7th grade video. There will be NO FCA huddle this Thursday. Today is HAT DAY!!!!!! Give your first period teacher $1 this morning. All money will be given to Strides Against Breast Cancer. There will be a Reading Olympics meeting this Thursday at all lunches in the library. Please plan to attend. If you cannot make it please see Mrs. McGarvey. All registration forms are due by Friday November 2nd so the teams can be registered. The “Pinked Out” 8th grade Field Hockey team finished off their unbeaten season defeating Upland by a score of 3-0. The Demons got off to a slow start but the offense was able to get on the board when Raina Bickel received a pass by Lucy Myers and was able to find the back of the goal. The offense of Bridget Wells, Norah Peterson, Ava Gavin, Sam Bevard, and Lili Lusvardi continued the pressure on the Upland defense when Megan Ward was able to sneak the ball past the goalie to give Kennett a two goal advantage. Jordyn MacMillan added the third goal of the game with a blast off of a penalty corner. Upland tried their best to get on the board, but had a difficult time getting past the mid field of MacMillan, Sarah Burns, Britney Sedano, and Norah Wolff. The defense of Elizabeth Calhoun, Kaitlyn Stolp, Hayley Holder, Isabelle Scopio, and Molly Kaplan limited the shots on Goal Keeper Maddi Sears assisting her with another shutout. Congratulations on an impressive season. Stay tuned for a video about Halloween. There will be a yearbook meeting today Tuesday October 30th in Mrs. Lozada’s room B001 until 3:15. If you are interested in joining the Yearbook club, please plan on attending. This Wednesday is HAT DAY!!!!!! Give your first period teacher $1 on Wednesday morning. All money will be given to Strides Against Breast Cancer. CONGRATULATIONS TO OUR TOP SEVEN BOYS AND GIRLS WHO RAN IN THE CHESTER COUNTY CHAMPIONSHIP RACE on Thursday. Please acknowledge Jack Igo, Jack Cammarata, Matt Wilson, Sam Kjelstrom, Jack Roche, and a special Shout out to Cole Elliot and Nate Braun who stepped up last minute and had fantastic times. Each of them received a personal best and ran like the wind! Not to be outdone, our girls Sadie Maxwell, Paulien Donnelly, Anna Jiang, Catherine Caldwell, Sharon Maxwell, Lexi Hoyle, and Lily Steffensen also performed beautifully. Their mile times ranged between 6 to 8 minute miles! The whole team has one more race this Tuesday to beat any season goals they set for themselves at Rose Tree Media Park. GO get them XC!! Yesterday the 8th grade field hockey team defeated Pierce by a score of 2-0. Kennett got on the board early with goals from Bridget Wells and Sarah Burns. The defense of Elizabeth Calhoun, Kaitlyn Stolp, Molly Kaplan, Hayley Holder, and Isabelle Scorpio helped Maddi Sears keep Pierce off the scoreboard. The team looks to finish the season on a high note this afternoon vs. Upland at Legacy field. Today’s Girls Soccer game has been canceled. Please go homo on the bus. Please bring your washed uniforms to school on Thursday and return them to Ms. Gottstein. 7th grade grade field Hockey finished their season yesterday against Pierce. The team came back to tie in second half with a goal from Noelle Foster. Taylor Hardin played a great goal in game. Great job 7th grade on a fantastic winning season! 7G! The 8th grade boys soccer team beat Chichester by a score of 2-0 yesterday. Edwin Bedolla began the charge with a fantastic goal, and Zach Mannices scored his first goal of the season in the final two minutes of play. Both Jonathan Zurita and Josh Kochersperger made great stops in goal to preserve the shutout. The team had a fantastic season, with only one loss. We are hoping to see each one of our 8th graders continue to play in high school. We are so proud of you boys and wish you the best of luck! The KMS Boy’s 7th grade soccer team wrapped up their season yesterday by defeating Chi Chester by score of 5-0. Saul Ayala Herrera played well in net, earning his first shut out! KMS goals were scored by JP Teixeira, Ethan Wentzel, Yuri Gerovasilliou, Andrew Turnbull and Lachlan Avedisian. The entire team played extremely well and ended the season on a 2 game win streak, having defeated Downingtown Middle School last Friday by a score of 4-2. Great season boys! There will be a yearbook meeting tomorrow Tuesday October 30th in Mrs. Lozada’s room B001 until 3:15. If you are interested in joining the Yearbook club, please plan on attending. Here is today’s motivational Monday quote. Now over to a special guest with our pride matrix mash up. KMS STUDENTS…come try to beat Mr. Moore at the Kennett Education Foundation Monster Mash 5K. The 10th Annual Monster Mash Dash will be held on October 28th at Anson B. Nixon Park. As of right now KMS is in the lead with the most participants signed up.That would mean we get the participation trophy to display in our building. Come out this Sunday. The race starts at 9:30 and you should usually arrive about an hour before the start of a race. KMS, Please Join Kennett High School on Saturday, Oct. 27th at Anson Nixon Park, from 5-7 PM for a Haunted Walk. There will be music, food, candy, a bonfire and games. $5 to enter or bring 5 cans. All proceeds will benefit the Kennett Food Cupboard. There will be a yearbook meeting on Tuesday October 30th in Mrs. Lozada’s room B001 until 3:15. If you are interested in joining the Yearbook club, please plan on attending. Attention all Volleyball Players: don’t forget to turn in your t-shirt orders to Coach Clapp by the end of the day today! Stop down to her room (D113) at any time today to turn them in. KMS STUDENTS…come try to beat Mr. Moore at the Kennett Education Foundation Monster Mash 5K. The 10th Annual Monster Mash Dash will be held on October 28th at Anson B. Nixon Park. There will be music, food and fun for all runners! This year…all KMS Monster Mash runners will receive a “Kennett Square” if they participate! And don’t forget to show up to run in your best Halloween costume! Register on the KEF website. Funds raised from this event go directly to supports grants, projects and scholarships for Kennett teachers and students. Any middle school girl interested in basketball open gym there will be a session on Thursday 10/25 at 6:15 at Kennett High School. A common myth is that men do not get breast cancer, that it affects only women. The Truth is quite the contrary. Each year it is estimated that approximately 2,190 men will be diagnosed with breast cancer and 410 will die. Thank you for wearing pink yesterday to support breast cancer awareness! The Middle School football team won another game yesterday against a big tough Scott Middle School team. The final score was 26-0 and scoring was led by Aiden Zdebski with two rushing touchdowns and one defensive touchdown after he picked up a Scott fumble. Zach Hulme finished off the scoring with a touchdown run. Both 7th and 8th graders played in this game and it was a real team effort with everyone getting in the game and everyone contributing to the shutout….Way to Go!!! The 8th grade boy’s soccer team defeated Great Valley on Wednesday afternoon by a score of 2-1. The entire team played great, holding the opposition to only a few shots on goal. Geo Soto and Ryan Barker worked well together, scoring the first goal and the game winner was scored by Edwin Bedolla. The boy’s final home game is Monday, 11/29 against Mrs. Anderson’s son’s Chi Chester team. Come out and support KMS! Yesterday afternoon, the 8th grade field hockey defeated Chichester by a score of 6-0. Lili Lusvardi led the Blue Demons with 2 goals. Lucy Myers, Bridget Wells, Megan Ward, and Norah Wolf scored one goal each. With help from the defense, Maddi Sears was able to preserve another shut-out for Kennett. There is NO football practice practice today or tomorrow. Next football practice is Monday. Now over to a Mr. Moore here to talk about red ribbon week. On Monday the 8th grade field hockey team defeated Avon Grove by a score of 4-2. Megan Ward led the way for Kennett with 3 goals and Jordyn MacMillan added a goal. Come out today as the team takes on Chichester at 3:15. 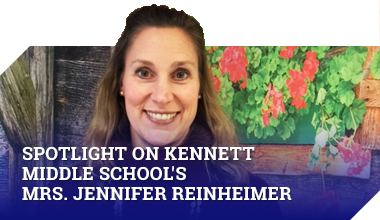 Kennett Middle School’s Cross-Country’s season is winding down and there are two races left. Please congratulate the runners listed below on their outstanding performances which landed them in the Chester County Ches Mont Championship Race! Those runners should report for a preparatory practice on Wednesday. All other runners should go home on the bus and make sure to do at least a ½ hour of aerobic activity. The whole team will have an early dismissal on Thursday to cheer on our top seven girls and boys. Please congratulate the following students this week. Now over to special guests talking about red ribbon week. KMS STUDENTS…come try to beat Mr. Moore at the Kennett Education Foundation Monster Mash 5K. The 10th Annual Monster Mash Dash will be held on October 28th at Anson B. Nixon Park. You can sign up to run the 5K or the newly added timed 2.5K run or walk. There will be music, food and fun for all runners! This year…all KMS Monster Mash runners will receive a “Kennett Square” if they participate! And don’t forget to show up to run in your best Halloween costume! Register on the KEF website at kennetteducationfoundation.org. Funds raised from this event go directly to supports grants, projects and scholarships for Kennett teachers and students. Congratulations to the 7th grade field hockey team for their awesome 6-0 win on turf over Avon Grove. Greta Burns and CJ Herring scored two goals each and Mary Carroll and Mia Matthews each placed one in the goal. Taylor Hardin had a great day in goal, shutting down every defensive corner for a shut out. Great work girls from the entire team! The 8th grade boys soccer team beat South Brandywine yesterday in the beautiful fall weather. Geovanni Soto and Reagan Pelletier led the charge with a goal each. Ryan Barker had two goals, and the highlight of the day was Nathan Zavala getting his first goal of the season! Go Nate!!! The boys have two more away games this week before taking on Chichester at home on Monday. Let’s go KMS!! Now over to a special announcement from Mr. the principals. Our first PTO dance is tonight from 6:30pm-8:30pm Please arrive no earlier than 6:15pm; doors open at 6:30pm. The cost of the dance is $5. IDs are not required; the dance is for KMS students only. Food and drinks will be on sale in the cafeteria. There is basketball in the small gym. Everyone should be nice to each other and show their Kennett PRIDE at the dance. It is important for students to be picked up on time. Parents should arrive to pick up students by 8:30pm and have fun! The 8th field hockey team defeated Stetson by score 3 to 0. Kennett goals were scored by Bridget Wells, Megan Ward, and Norah Peterson. Maddi Sears preserved the shutout with 5 saves. Way to go Kennett! Congratulations to the 7th grade Field Hockey team on their hard fought 2-1 win yesterday against Stetson. Shout out to Riley McQuiston, scoring both goals. The winning goal was scored in the last minute and a half with solid team work from Izzy Freidrich, Mia Matthews and Mary Carroll. Awesome win, and some awesome saves by Taylor Hardin in goal. Stay tuned for Flocabulary, its Friday! FCA (Fellowship of Christian Athletes) will meet this Thursday morning at 6:50am in Mr Bowling’s room and is over by 7:25. Breakfast will be served. FCA is open to all KMS students. Come and check it out. Attention all students. When was the last time you changed your blue demons account password? Last Month? Last Year? Never? If so, listen up… It is crucially important to secure your BlueDemons account password and to change it often. Please be sure to check your e-mail for directions on how to do so. Or, check the mounted displays above the student store or in the office for specific directions. Flu Vaccines will be offered in the cafeteria at Kennett High School this Thursday, October 18 from 2:30 –6:30 PM. Flu Vaccines are free and it’s an important step toward staying healthy. Talk to your parents and bring your whole family to the High School this Thursday. There will be an informational meeting about Reading Olympics on Wednesday, October 17th in the library at all lunches. Anyone interested in participating should attend. FCA (Fellowship of Christian Athletes) will meet this Thursday morning at 6:50am in Mr Bowling’s room and is over by 7:25. Breakfast will be served. FCA is open to all KMS students. Come and check it out. Good luck to KMS’ Cross-Country as they race Peirce Middle School and Great Valley today, Tuesday. When you see the team, please wish them Speedy feet!! XC team, Just a quick reminder to please meet in front of the school store for your early dismissal following 8thperiod. The bus will leave no later than 2:05 pm. Remember, we run rain or shine! The 8th grade boys soccer team tied Unionville by a score of 1-1. In a hard-fought match, Reagan Pelletier got his first goal of the season. The boys played their hearts out in the cold, wet weather. Both boys’ soccer teams play Coatesville at home on Wednesday. Let’s go KMS! The 7th grade girls soccer team defeated Patton Middle School with a tremendous defensive effort. The final score was 2-0 with both goals coming in the final minutes by Kiran McVey and Ella Merritt. Ella Haskins maintained a shutout in goal. Congratulations on your hard work ladies!